numerous articles and editorials in various Christian and secular publications, and has also written Sunday school material for Word Aflame Publications. She is a graduate of the Christian Writer's Guild. She has spoken at ladies' retreats and conferences for thirty years and taught marriage seminars with her husband, Rev. John Putnam, Wisconsin District Superintendent. Joanne has a Bachelor of Science Degree in Special Education and Elementary Education and taught in the public spectrum for thirty-five years. As well as being a minister's wife, she is the mother of three grown children who are all active in various aspects of ministry and grandmother of six. She writes to encourage people to fulfill the call of Christ as they endeavor to do His will in their life. 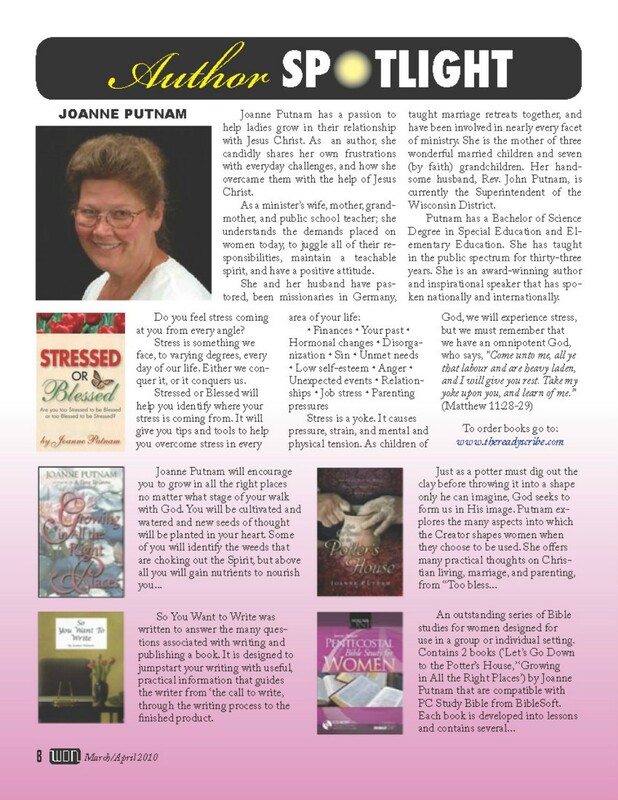 Her recent subjects include becoming a published author and spiritual growth issues.